During this time of year, it’s important to reflect on all for which we have to be thankful. And as a PR and marketing agency, the digital age has given us a lot to appreciate. We give thanks to the following because, without the items on the list, our services would not be as essential. Autofill: Oh, autofill! Without you, we would see fewer emails inadvertently delivered to the wrong recipients. Of course, we all think this mistake won’t happen to us. But if the Navy and the White House aren’t safe from email accidents, then who is? Microphone gaffes: Want your voice heard? Use a microphone. Want to make headlines? Leave the microphone on. That’s a lesson everyone from President Obama to Vice President Joe Biden has learned the hard way. Fortunately, it helps to have a good sense of humor – and a pretty stellar PR team. Twitter: The social media site is your platform to the world, for better or worse. And as we have seen time and time again (thanks US Airways, the New England Patriots and the NYPD, to name a mere few), nothing reaches eyes and ears faster than an ill-conceived tweet. Memes: A picture is worth a thousand words. And in this day and age, a picture plus some words is worth a lot more than that. That’s pretty much what Internet memes have evolved into, and when wielded by the clueless, they can have disastrous results, as evidenced by the recent Bill Cosby meme implosion. Sound bites: It used to be that a sound bite was just a bit of audio lifted from a longer interview. But thanks to the Internet, any 12-year-old can take a quote and turn it into viral gold. While this can be all in good fun (see Brian Williams singing “Rapper’s Delight”), it’s easier than ever for a poorly thought out statement to become the next punch line on the late night talk show circuit. But above all else, we are most thankful for you – our clients, our friends in the industry and those in our Jaffe family. It is with your trust and support that we get to do what we love most – helping law firms and lawyers reach their ultimate potential. 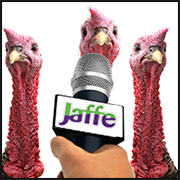 From everyone here at Jaffe, have a safe and happy Thanksgiving!